Sales of state trust lands, or “dispositions,” are governed by restrictions in the Arizona-New Mexico Enabling Act as well as the Arizona State Constitution, which require that trust lands be sold for “highest and best use” at a publicly announced auction for fair market value. Since 1912, the Arizona State Land Department sold, exchanged, or otherwise disposed of over 1 million acres of state trust lands. For much of the early history of the ASLD, the sale of trust lands happened in a somewhat reactive pattern driven largely by a developer’s or other purchaser’s interest in the parcel. The resulting mode of responding to buyers meant that trust land sales were not always strategic in serving the best interests of the beneficiaries or gaining the best price per acre. However, in 1981, the state legislature passed the Urban Lands Act and later, in 1998 and 2000, the Growing Smarter legislation that collectively provides guidelines for a more proactive, defensible, and rigorous planning process prior to the disposition of state trust lands. 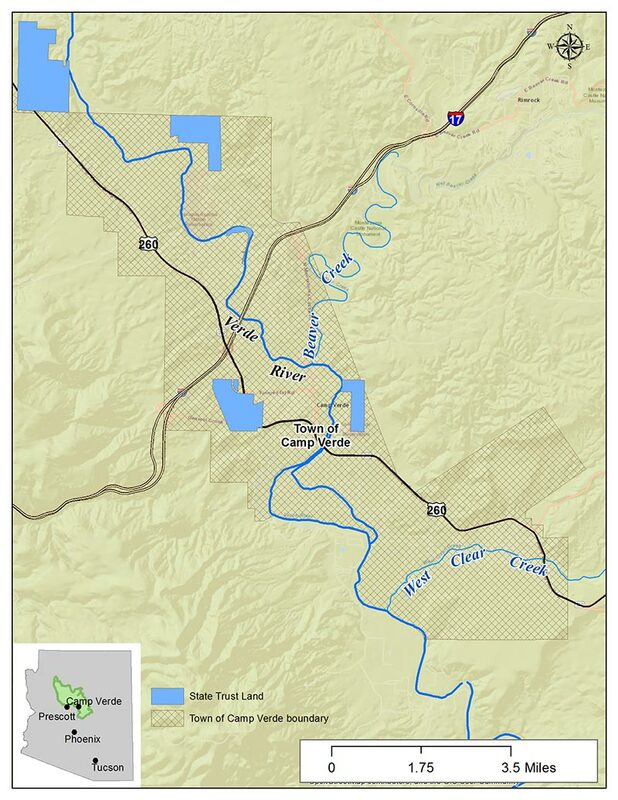 The potential sale of state trust lands for development within the Verde River watershed, combined with community plans for full build-out involving those lands, could present significant challenges to providing adequate water supplies for new residential development. 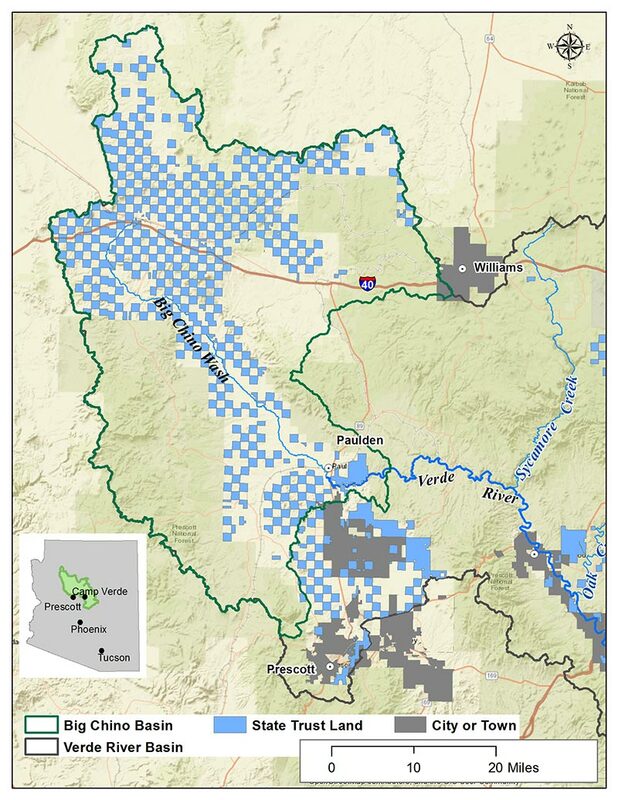 State trust lands account for approximately 25% of land ownership in Yavapai County, and development of those lands under current plans would exacerbate drawdown of aquifers that, in turn, would impact Verde River flows. Sale of any number of the 6,200 acres of state trust lands in the Big Chino Valley would have the most profound impact because the water supplies for such development would likely be groundwater pumping that would deplete the aquifer and reduce the base flows in the Verde River headwaters. In the Verde Valley, however, state trust land parcels are fewer in number. The City of Cottonwood is the only community with significant acreage of trust lands; it has 980 acres located within city limits, and a 10-square mile parcel, located just on the boundaries of the city. 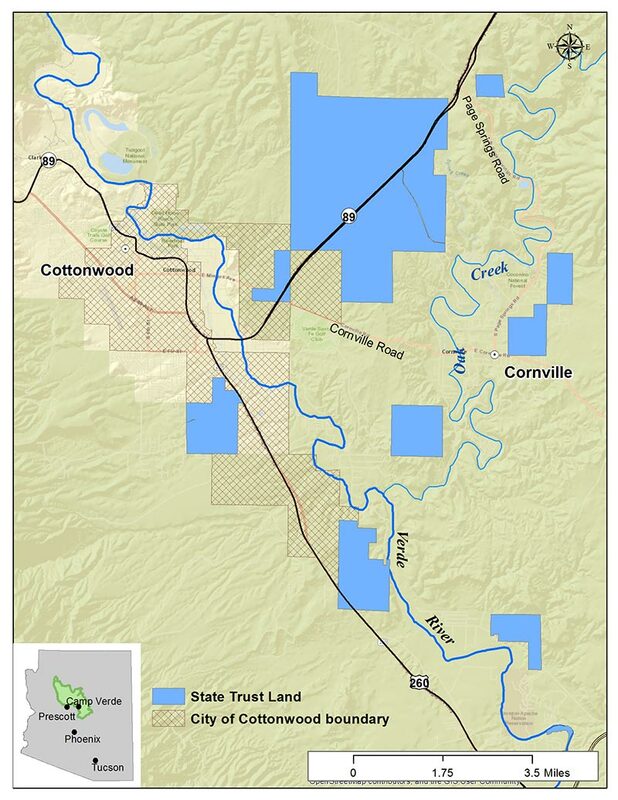 Cottonwood’s recently adopted General Plan identifies trust land parcels within city limits in its “planned development” classification, and it details an annexation plan to bring the 10-square mile parcel into city limits and implement a conceptual plan that involves the establishment of “village” planning sub-areas, mixed use development, and an open space component. Development of these state trust land parcels under a “business as usual” scenario for residential development, including the groundwater pumping that would be required to service those homes and businesses, would have considerable impacts on Verde River base flows. The remaining state trust land parcels in the Verde Valley lie near Cornville and Camp Verde. Because Cornville is unincorporated, a discussion with the Cornville Community Association and/or the county would be needed to ascertain their intentions regarding the future of the state trust land parcels near their community. The Town of Camp Verde, which includes a little over 1,700 acres of state trust lands within its town boundaries, has expressed no immediate plans for the development of those trust lands. The majority of the parcels are located at some distance from main thoroughfares and are outside of the planned development areas for Camp Verde. Exploring options for protecting state trust lands’ watershed values – either through conservation strategies that support the fiduciary goals of the trust, or limited, low-impact development – could meet the trust responsibility requirements for revenue generation while also meeting goals for preserving a perennially flowing Verde River.